"Reaching the 7th Trombone Position"
7 is all the way out on the trombone slide, just past where the raised parts at the end of the inner slide tubes begin. If you have trouble reaching all the way out to 7, reach as far as you can. You may need to push your right shoulder forward to help make your reach longer. Keep doing this and after awhile you'll be surprised at how much length you can add to your reach! You will also want to open your hand so that your fingers point away from you. 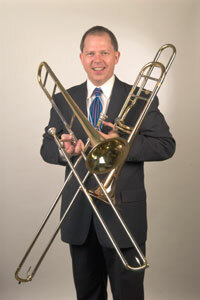 Hold onto the lower trombone slide tube with your second and third fingers. You will probably not be able to hold the slide bar with your thumb and open your hand, so hold onto the lower slide tube with your second and third fingers. If your arm is very long, you may not need to do any of this. If it is short, you may need to do as much of it as possible. If your arm is somewhere in between, use as much of one or both as needed to help you. You will be able to reach 7, just find the right way and practice until it is easier to do.